With its encampments mostly destroyed, the nascent Occupy Movement in thousands of communities across the U.S. and dozens more around the world has not faded away. Instead, it has rebounded in multiple forms, reclaiming foreclosed homes, occupying banks, shutting down ports, interrupting university trustee meetings and political speeches at the Iowa Caucuses, and forcing people on the streets, in Congressional corridors and at city halls to address how the one percent's wealth and power has created a stranglehold on the 99 percent. The Occupy Movement exploded after the Wisconsin state Capitol occupation and Arab Spring, as if tens of thousands of people suddenly discovered allies and a voice to confront what they perceive as a corrupt power structure. As the movement matures, however, it will be challenged to sustain its momentum, while continuing to embrace a diversity that includes anarchists and progressive Democrats, those without homes or jobs or hope and those in the middle class, and people who suffer from racism, sexism and homophobia as well as those who do not. The future of the consciously leaderless movement is being determined both within the confines of its formal decision-making structures and, increasingly, through allied and autonomous groupings. General assemblies, the decision-making body of most Occupies, were designed to give voice to multiple views. Eschewing majority rule, the Occupy GAs generally require 80-to-90 percent approval of proposals. Nonetheless, some participants say the system remains biased. Frequent attendance at GAs is difficult for many. Others say that concerns of people with minority positions are ignored. Oakland housing rights activist James Vann is among Occupy Oakland participants who have called in vain for a GA statement supporting non-violent actions. He says these concerns are ignored by the majority. The GA approved a statement that accepts 'diversity of tactics', which can include property destruction. It takes a 90 percent vote to reverse the decision, which observers say is unlikely. While Oakland's GA attendance has dropped from thousands to dozens, the movement itself 'keeps going, forcing people to think about new ways to move forward and to resist the disenfranchisement that motivated the occupy movement to begin with,' said Scott Campbell, an Occupy activist shot by police with what was likely a lead-filled bag while filming police lines at the Nov. 2, 2011 General Strike. Campbell said dialogue among people of diverse views is the way toward a more unified movement, but without an encampment, spontaneous discussions don't happen. Space to meet and exchange ideas will be reestablished when Occupy Oakland takes over an empty building Jan. 28, he said. Meanwhile, many participants are turning their energies from assemblies to other ways of participating. Neighbourhood occupies are being formed. 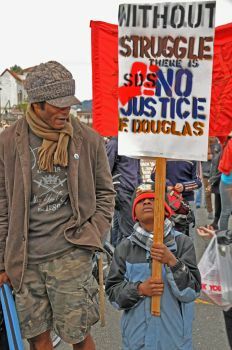 An activist known as Stardust is working with newly- formed Occupy Bernal. The San Francisco neighbourhood in has been heavily impacted by foreclosures, with some 900 since 2008, Stardust said. The area includes around 100,000 people. One of Occupy Bernal's first activities was to chart new foreclosure notices in the area, initially identifying 80. 'We're going house by house,' Stardust said. Anyone wanting help to save a home will get it. Assisted by housing rights organisations, Occupy Bernal will support homeowners asking banks for loan modifications. They'll also demonstrate at banks, interrupt foreclosed home auctions, reoccupy foreclosed homes and shame foreclosed home buyers. Stardust said Occupy Bernal coordinates with Occupy San Francisco. And there are nationwide organising efforts. Occupy Our Homes supports homeowners re-entering foreclosed buildings and targets corporations profiting from unscrupulous loans. It sponsored the national Occupy Our Home Day Dec. 6. Just before the New Year, IPS interviewed Maiya Edgerly at her mother's West Oakland townhouse, which the family re-occupied with the support of Occupy Oakland and the Alliance of Californians for Community Empowerment on Occupy Our Home Day. In July, Edgerly, 22, a student at Texas Southern University, and her 14-year old sister were ordered out of the house the family had lived in for 15 years and onto the curb by a deputy sheriff. Edgerly's mother was at work. ACCE, Occupy Oakland volunteers and friends help the family protect the home. After two demonstrations at a local Chase Bank branch and an Occupy Wall Street demonstration at bank headquarters in New York, Chase sent Edgerly's mother a letter saying they would meet with her, but the bank has not followed through, Edgerly said. Scott Campbell questions the extent of the Occupy Movement's participation in getting people back into their homes; he would like the movement to aim higher. Worker solidarity is another theme that west coast Occupies plan to carry collectively into 2012. Occupiers from several west coast cities plan to travel to Longview this month to picket EGT on behalf of union workers. Occupy Wall Street donated 12,000 dollars to the effort. Another Occupy target is the Citizens United Supreme Court ruling that treats corporations as humans, with the same rights. Occupy and the organisation Move to Amend are planning the occupation of 80 federal courts on Jan. 20. Occupy San Francisco will target the Financial District. Students are playing key roles in Occupy, challenging tuition hikes and the banks that profit from student debt. During winter break, a group of Northern California students, faculty, university workers and community Occupy groups have been planning a week of action in March and gearing up to support a California initiative to tax millionaires. 'Moving forward, we need to make the bankers and millionaires who caused this crisis refund us,' said Charlie Eaton, a graduate student in sociology at the University of California, Berkeley and United Auto Workers 2865 financial secretary, helping to organise the campus movement. 'We need to continue making them face personally the crisis they've caused for all of us,' he said, promising 'unrelenting direct action' from students.